16 cards. Inserted 1:24 packs. 17 cards. Inserted 1:24 packs. 9 cards. Inserted 1:24 packs. Inserted 1:4 packs. T50 exclusive to Rittenhouse Rewards program. Some collectors may be starting to wonder how many more Star Trek sets the hobby needs. Yet, Rittenhouse continues to take on new angles and introduce new inserts. 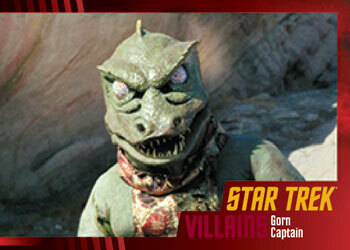 2013 Rittenhouse Star Trek: TOS Heroes and Villains mixes the familiar with the fresh, particularly for those who stick mainly to the iconic franchise. 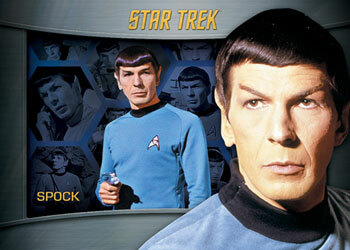 Over the course of 79 episodes, the Star Trek mythology introduced plenty of good guys and even more bad guys. They come together for a base set that focuses on the many conflicts and enemy encounters. 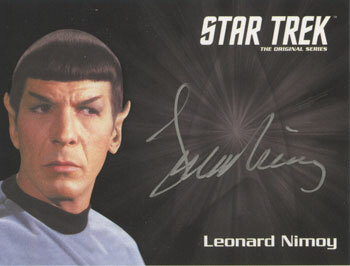 Every 2013 Star Trek: TOS Heroes and Villains box has both a standard Autograph and a Dual Autograph. 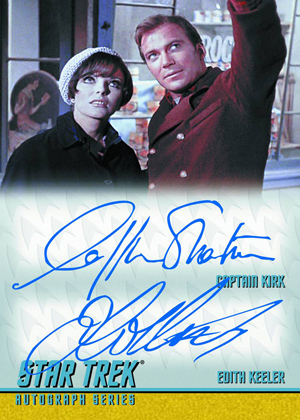 Confirmed signers include William Shatner (Captain Kirk), Nichelle Nichols (Uhura), Walter Koenig (Chekov), Clint Howard (Balok) and Grace Lee Whitney (Janice Rand). 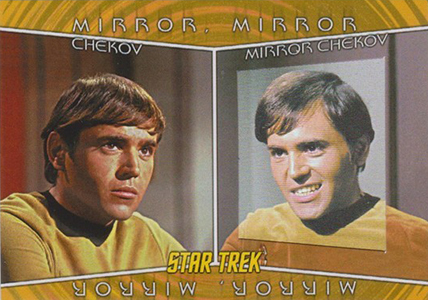 Six Bridge Crew Shadowbox cards showcase the main cast members with a distinct 3-D look. Based on one of the most popular episodes in the show's history, not to mention one of the most valuable inserts from the franchise's run with Fleer/SkyBox, are eight new Mirror, Mirror cards. 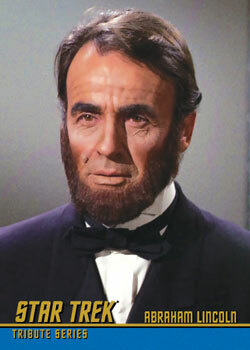 Star Trek Tribute expands by another 18 cards, honoring the actors and actresses from the show who have passed away. Finally, the nine-card Epic Battles set spotlights the most epic conflicts. 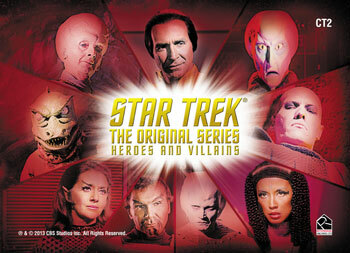 Sold separately, a 2013 Rittenhouse Star Trek: TOS Heroes and Villains binder comes with an exclusive promo card. 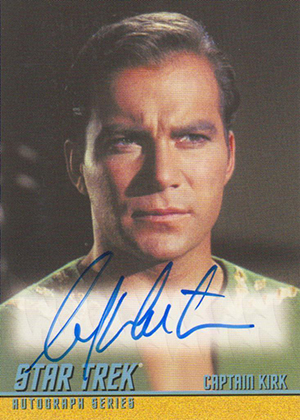 I heard Captain Kirk AKA William Shatner will only be featured on a double auto card, I could be wrong. Call me a fanboy, but I’m very excited for these to come out. With the new Star Trek movie coming out this summer, I’ve been re-watching the original series…nothing can be a better companion than these cards. Between this set and the hopefully equally-as-awesome Star Trek: Into Darkness set in the future, I will be doing some serious damage to my wallet. Set phasers to kill. like a dual auto Shatner/Pine. Could you imagine? Maybe the license agreements prevented it. local collectors in Stockton ca?